I hope this newsletter finds you well. With Region 2's elections in the Valley behind us, we are fully in the Neighborhood Council election cycle now with EmpowerLA and City Clerk staff both qualifying candidates and holding elections at the same time. I want to congratulate Porter Ranch Neighborhood Council on their great election turn out in pouring rain no less last Saturday. Thanks to Ethan Turer, their Youth Rep and Election Chair, and the PRNC board and election volunteers, they signed up 23 candidates for 5 open seats and had 730 people come out to vote! On election day, Ethan was using social media to remind their stakeholders to come out and vote. Congratulations to Ethan and PRNC since they have taken the lead in getting Mayor Garcetti to come out to swear their board in! I stopped by USC this week to talk about Neighborhood Councils to master students in Terry Cooper's public policy class. Terry is the Director of the USC's Civic Engagement Initiative, and has studied the Neighborhood Councils from the start. We're talking about how USC can do a follow up study on the impact of Neighborhood Councils so hopefully we can make that happen soon. I'm also talking with UCLA about how we can work together to create Neighborhood Council profiles to provide board members with the necessary information about their community history, demographics, zoning and assets to support their work. 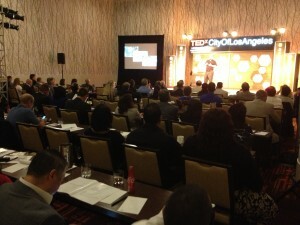 Yesterday, I was at the first TEDx for the City of Los Angeles, which was organized by the Emergency Management Department. It turns out that General Manager Jim Featherstone, who is Interim Fire Chief now, is a big TED fan as I am, too. He and his team put together a great TEDx session for City employees that covered emergency management and leadership issues with presenters both local and across the country, including our LAPD Chief Charlie Beck. I'm picking the brain of his staffer, Chris Ipsen, who coordinated the event about how we can do something about civic engagement since Los Angeles' Neighborhood Councils are setting the standard in that arena. I'll be trying to get around to all the polling locations in my little electric car tomorrow in Region 1 of the Valley. If I don't see you, enjoy the warm weather this weekend!